MDX (Multidimensional Expression) is a language construct to query OLAP cubes. 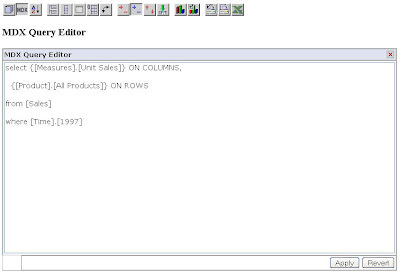 It is much like SQL is a language construct to query relational database. MDX was an initiative of Microsoft as part of the OLE DB for OLAP (ODBO) specification in 1997. Mosha Pasumansky is one of the architects of the language. MDX was soon implemented by many OLAP vendors as their standard OLAP query language including Mondrian. With MDX you can query a selection of Online Analytical Processing (OLAP) data, doing some calculations, and retrieving meta data properties. 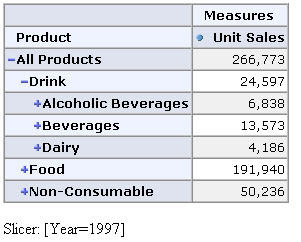 This will query from "Sales" cube a "Unit Sales" measure value from "All Products" dimension that happened in 1997. You can try it against Foodmart sample database. Mondrian has implemented many of standard MDX expressions supported in MS Analysis Server. You can find a detailed of the expression here. Browse to one of your sample JSP file, for example "JPivot pivot table"
I want to hide some buttons on the toolbar... is this posible? OpenOffice Recovery Takes Forever ?